The students of the Law Faculty, Delhi University sat on a hunger strike from 2 pm, 14th of September. The strike was against the mass failures of students that had occurred for the second year in a row. Alleging some problems with the results, they went on an indefinite hunger strike, urging the authorities to look into their grievances. Following the declaration of the results, the students began discussions with the teachers and faculty as to how the matter can be addressed and proper steps for re-evaluation of the papers. Almost half of the students had flunked and scored much less than they expected. After coming to a dead end the students decided to sit on an indefinite hunger strike from 2pm on the 14th of September in front of the office of the Dean, Faculty of Law, Campus Law Center building. Brajesh Singh, Mithilesh Jaisal, Nishant and Mohit Gupta were the student representatives leading the strike. They alleged that some students were even marked after they had appeared for the exams after a thorough revision of the scores was carried out. The Faculty of Law has three centres – Law Center I (LC I), Law Center II (LC II) and Campus Law Center (CLC). CLC admits the highest scorers of the entrance exam. According to one report, almost 882 out of 1, 944 students have failed in at least one subject. Students who had scored first division last year have also scored less this time. Around 350 students face year back due to failure in one or more papers. 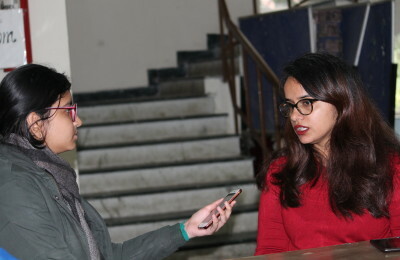 On the fourth day of the strike, Saturday, the Dean, Ved Kumari, being unable to appeal to the students to call off the strike, sat down in protest against them herself. She was recovering from Chikungunya and her health was very weak. Two other teachers, Kamla Shankaran and Kiran Gupta joined the Dean in an attempt to have a dialogue with the students. Since the Dean could not make any promises herself, the students demanded that the Vice Chancellor or his representative come down and negotiate with them. They refused to call off the strike till any such action was taken. Free revaluation for this semester and for introducing a full fledged revaluation scheme. Modification of the currently existing improvement system with best of two. These demands were addressed to the Vice Chancellor, Proctor, Dean, Faculty of Law, Dean, Students welfare, University of Delhi in addition to the S.H.O. Maurice Nagar police Station. After almost 70 hours of strike and no response from the authorities, the student took the strike a step further and on the 17th of September proceeded to burn the effigy of Professor S.C. Raina, whom they claimed responsible for the mass failures. They marched from the office of the Dean, Faculty of Law till the office of the Vice Chancellor. Seeing as the students were not willing to give on the strike, an attempt was made to pacify them with verbal assurances and promises. The Joint registrar (Legal Branch) came and verbally assured them that their demands will be looked into and that they should call off the strike. DCP of North, Madhur Verma came as a representative of the Vice Chancellor and tried to call off the strike. When all attempts failed to sway the students, the Dean, Ved Kumari came the next morning signed a written agreement stating that the authorities will complete their demands as soon as possible. The first demand, ‘Relaxation of Promotion’ will be dealt with first and on a priority basis. The rest will have to be passed through the Academic council and the UGC council for approval. Seeing the authorities give in to their demands, the students called off the strike between 9 and 10 am, on Monday, the 19th.